Silk tie-dyed Easter eggs are so much fun to make and way less messy than buying a dying kit or using vinegar and food coloring! 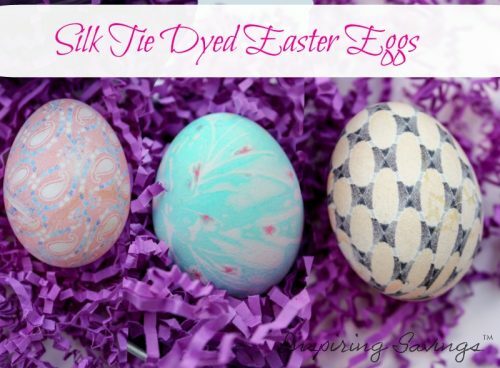 Make beautiful looking dyed Easter Eggs with this easy DIY Silk Tie Easter Eggs Tutorial. 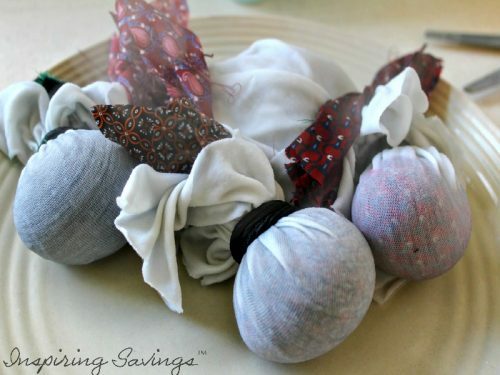 All you need is some old silk ties, hard-boiled eggs, and Vinegar. Recently, I went through my husband’s ties. He has quite the “vintage” collection. It just so happens, each year we try to mix up some fun and unique ways to dye our Easter eggs. I decided, that instead of throwing out his ties that we would use them for a fun new project. 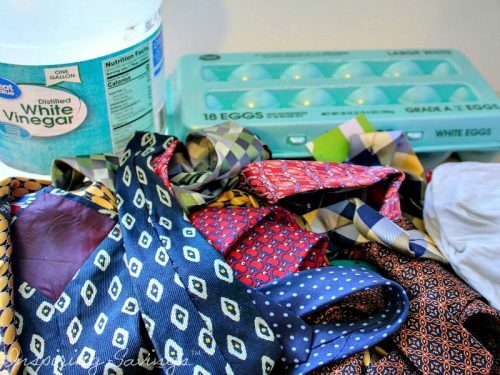 Not only did I declutter and organize my husband’s ties, but I was able to use them in this DIY Silk Tie Dyed Easter Eggs Tutorial below. Pretty cool! It certainly made me feel like Marie Kondo. BIG TIP: You need 100% silk for this to work. Make sure to check the labels to make sure you’re not using polyester, which can look similar. Often times the tags on ties are very hard to find but search and you will find. 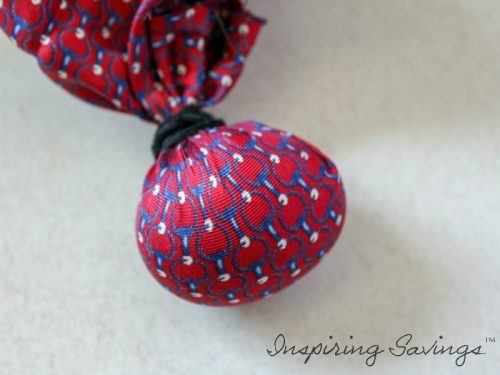 Remember, when it comes to ties, you may not want ugly ones on your man, but ugly ties do make pretty eggs! 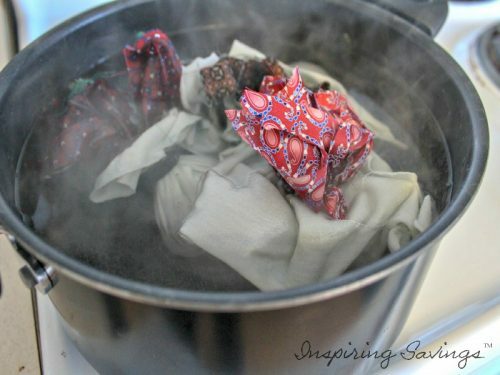 You could also use silk from an old blouse, a scarf, or whatever. If you’re rummaging through a thrift store, check out some other areas as well. In a large pot, fill with water and about 2 cups of vinegar. Bring to a boil as you are completing the next steps below. 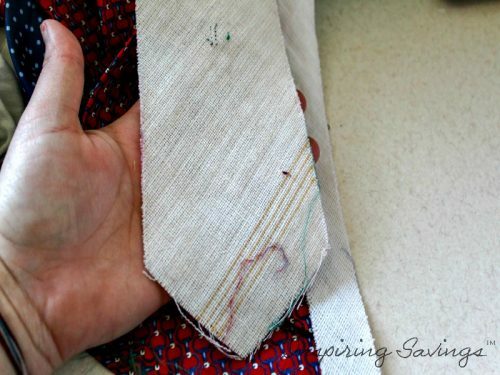 Start by taking your tie apart. You will need to take out the filler fabric and just use the silk. Cut down the center of the back of the tie to open it. Once you open it up there will be enough silk to wrap about 3 medium or 2 large sized eggs. Of course, this number will vary by your tie size. My husband use to own some very thin ties (by the way narrow ties are now making a come back). Just enough to cover 1 large egg. 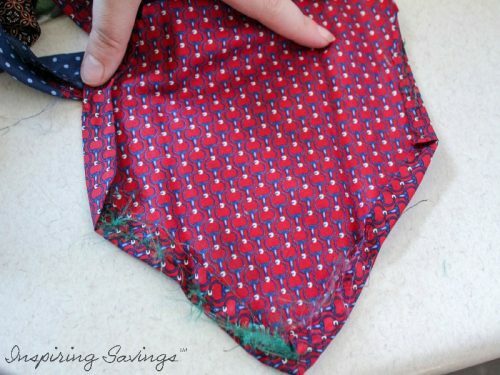 Once you are done deconstructing your tie it should lie flat very easily. Next, cut a piece large enough to cover an egg. Wrap the egg with the right side of the fabric making contact with the egg. The right side is the printed side or the side that would be on the outside of the tie. You want to try to wrap the fabric as tight as you can without breaking the egg of course. The more direct contact the silk has with the eggshell the sharper and brighter the imprint of the pattern will be. Cut a piece of the white flour sack to wrap around the egg and do it over the tie. This keeps the color from bleeding from one egg to another. It also helps the silk stay tight and not shift so much. Slowly and gently add your wrapped eggs into your pot of boiling water. Remember to add about 2 cups of white vinegar to the water. This helps the colors transfer! Boil for 20-30 minutes. The longer they boil the brighter the colors tend to be. Take them out of the boiling water (careful they will be HOT). Then, unwrap! Taking off the rubber bands (or headbands) and fabric to see the beautiful patterns that have now been transferred to the eggs. This often feels like Christmas to me. Unwrapping presents. It is such a fun project. 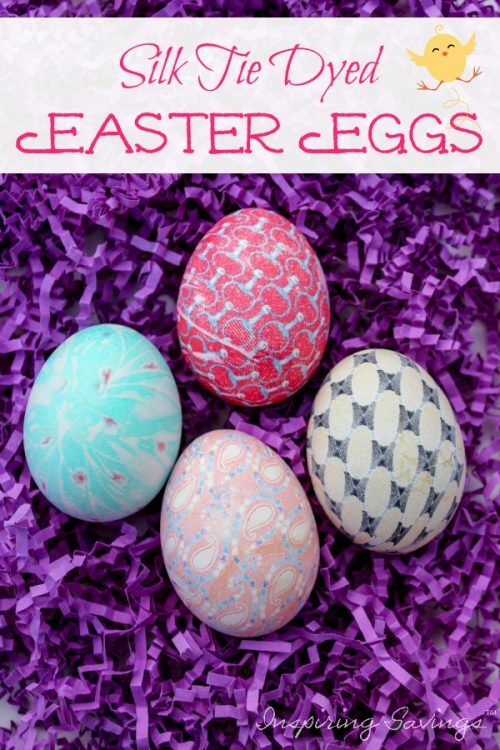 I know you will be happy making these DIY Silk Dyed Easter Eggs. I wish eggs came like this at the grocery store. How pretty? Try this out and let me know how it goes. Everyone will wonder how on earth you eggs came out so detailed and beautiful. Just tell them you’re a genius or (wink wink) give them the name of my website. Just a word of advice – Since you don’t know what kinds of dyes are used to color the fabrics, and chances are they are not food-safe, we don’t recommend eating the eggs. These are just too used for decorating and enjoying.